NEWS! Fresh new batch of Karma Cleanse 2019 is ready now! Edgar Cayce Remedy Karma Cleanse Tonic is made from wild harvested herbs. 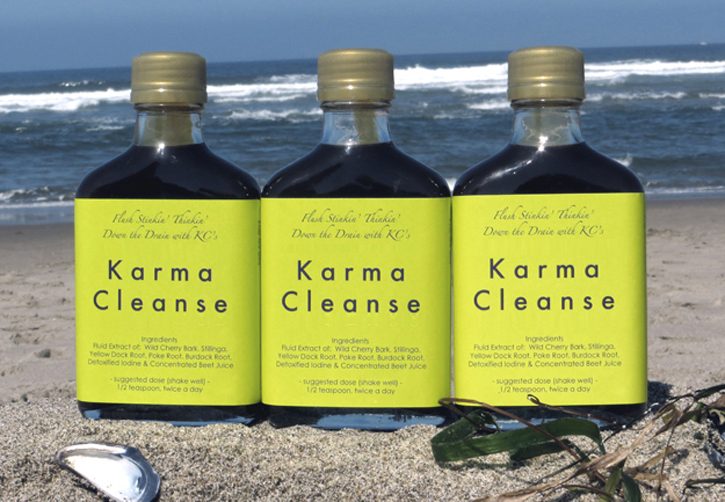 Many are harvested in Autumn, and we made a fresh batch of our Karma Cleanse. Just like fine wine, each year the crop is different yet the same. John has tested this new batch on many New Yorkers, and says this 2019 batch is Wow!!! Amazon Shopper 3 pack Special! Reply with order confirmation or contact us form. Please leave a great review so that Amazon shoppers know what a great product this is! Karma Cleanse includes Organic Detoxified Iodine and many other ingredients which have been time tested to detoxify and cleanse the body. In Chinese Medicine, Karma is related to various body organs such as the liver, gallbladder, pancreas, kidneys, stomach, and intestines<. Karma Cleanse detoxifies your organs, releasing stuck Karma from your body. This will assist in any other Karma Cleansing practice which you may be moving through, including Yoga Karma Cleanse, Ayurveda Karma Cleanse and Taoist Master Sha Karma Cleanse, etc. In Eastern cultures, ancestral weaknesses are carried over in the body organs. Cleansing your Karma is a practice of cleansing one's body, mind, soul, & spirit. Karma Cleanse has 4 drops of detoxified iodine per teaspoon (2 drops per 1/2 tespoon serving) Detoxified Iodine supports thyroid health. On the 6th day of September, 1924, Edgar Cayce gave a reading for a male adult who was dealing with an advanced sarcoma, which the reading classified as a bacilli in the blood. Along with recommending the Abrams machine to produce the resonant bacilli frequency, or counter frequency if you will, Edgar Cayce suggested the use of an herbal tincture blend as a blood cleanser. Ultimately Harry drew unto him a number of detractors. Some were envious of his astounding cure rate while others simply 'wanted a piece of the action. But Harry's secret formula was closely guarded and he cleverly masked it's original inception with an elaborate story of how the ingredients "were originally passed down to him by his grandfather. The story went something to the effect that his grandfather, who was a veterinarian, observed one of his horses, which happened to have a cancerous condition, and what the horse happened to be eating in the pasture. Notes were taken, and when the horse cured itself, the formula was derived. Of course logically, there's no way all of these herbs would have been growing in a single pasture, not to mention the illusive iodine herb, but most people, on up to today, believed Harry's story. It was something about an animal's intuitive ability for self-preservation that really stuck. The Abrams machine has long gone out of production, but as Harry Hoxsey continues to demonstrate from his grave, the Cayce blood cleanser is, and can continue to be and effective tonic for alleviating the root cause of malignant cellular activity: blood toxicity. Individuals could start percolating this relatively simple herbal blend which could then be dispensed to those in either a predisposition (marker) state, or a cancerous state. If enough people benefited from it a homegrown industry could eventually replace the allopathic model. Conceivably this single idea could derail the trillion dollar cancer treatment industry, not only salvaging the health and well being of millions of people but potentially avoiding an almost certain economic collapse which will likely precipitate from the present belief system. Perhaps even more important, if a grass roots movement of this kind actually did demonstrate it's viability, no doubt it would become a model for addressing other health/ illness issues, as well as pave the way for future political, economic, and social reform. As I see it we're at the crossroads. We can either get our butts off the couch and into the lab, or we can have them handed to us in a sling. Of course there's always the option of the gazillionaire who is going to finance a facility to put this idea back in motion, but I don't think I want to wait around for that to happen. What's say we move this party forward and get on with the process of evolution. This blood-cleansing tonic includes detoxified iodine and fluid extract of wild cherry bark, stillingia, yellow dock root, poke root, burdock root, as well as syrup made with beet sugar. Edgar Cayce readings have 113+ references to beet sugar or beet juice, where the pancreas, kidneys and digestive organs were uncoordinated or out of balance. In our Karma Cleanse, we have found one of the highest quality beet sugar syrup made of concentated beet juice imported from Germany. According to Dr. Oz, beet juice has been found to have many health benefits, especially for detoxifying the liver. 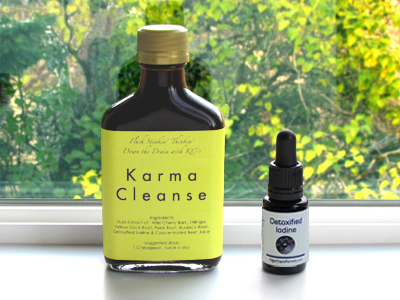 Karma Cleanse includes our Detoxified Iodine. Save by buying Karma Cleanse for all in one bottle supplement. See below for botanical highlights of Karma Cleanse ingredients, and their nourishing, tonifying, and cleansing benefits for your whole body. Root Karma Cleanse is here in 2019 by Customer Request!!! 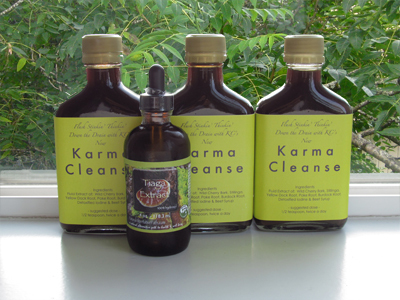 Karma Cleanse is available in 3 packs! 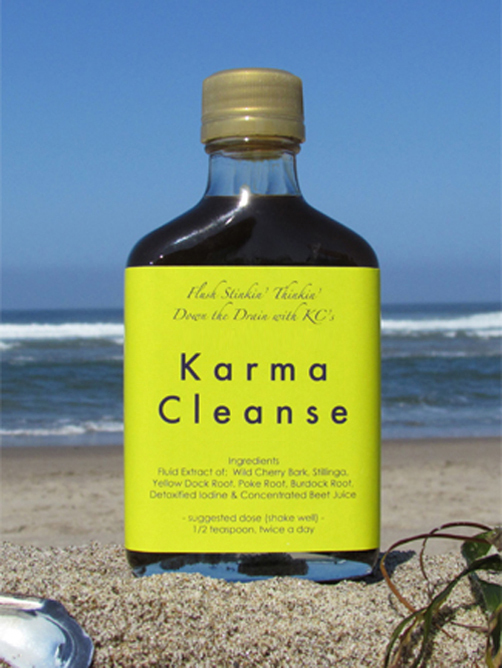 Karma Cleanse is artisanally hand-crafted using the European method of tincturing herbs in organic gluten-free alcohol. Karma Cleanse, the herbs were tinctured in Glycerin. 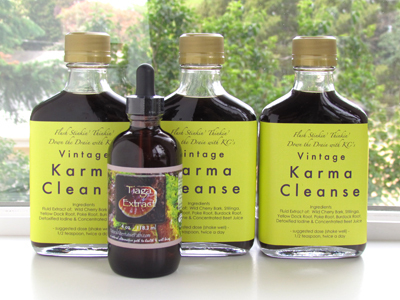 Karma Cleanse has Traditional Roots which are tinctured all together, and the Wild Cherry Bark tinctured separately. As we age the metabolism slows down, so you need to get out and exercise more, eat more fruits and vegetables, get off sugar (for the most part), and yes, pump up the thyroids with the iodine (which has a lot to do with metabolism). Tiaga Extract Tincture is made with alcohol, in the European traditional roots of Herbal tincture making. For people who can take alcohol, our Tiaga Extract Tincture is a preferred option, as the alcohol acts as a preservative, therfore the shelf life is the same as with other alcohol based tinctures. Tiaga Extract, is alcohol free for those who cannot have alcohol based tinctures. antitussive, expectorant, mild sedative, astringent, digestive bitter, tonic, pectoral, stomachic Indications: irritable and persistent cough of bronchitis, pertussis, cough due to increased irritability of respiratory mucosa. Nervous dyspepsia. Prunus is an important cough remedy. The cyanogenic glycosides are hydrolysed in the body to glucose, benzaldehyde and hyanocyanic acid, otherwise known as prussic acid. Prussic acid is rapidly excreted via the lungs where it first increases respiration and then sedates the sensory nerves which provoke the cough reflex. Due to its powerful sedative action, it is used primarily in the treatment of irritating and persistent coughs when increasing expectoration is inappropriate, and thus has a role in the treatment of bronchitis and whooping cough and in the racking cough of debility or convalescence. It can be combined with other herbs to control asthma. Both the cyanogenic glycosides and volatile oil help to improve the digestion, and Prunus may be used as a bitter where digestion is sluggish. The cold infusion of the bark may be used as a wash in eye inflammation and as an astringent in diarrhea. Edgar Cayce recommended wild cherry bark for pulmonary conditions and as an aid to digestion. It was also noted for its role in cleansing and building blood. 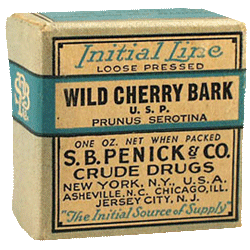 Wild cherry bark was mentioned in 312 readings between 1921 and 1944. Background:This plant grows in sandy soil from Maryland to Florida; along the Gulf of Mexico, and westward toward Colorado. The leaves are elliptical and leathery, having almost no base where attached to the stem. Yellow florets appear on the spiked stems from March to August, or longer where the weather is warm. The plant must be fresh to be effective. The resinous, milky juice in the yellow-brown root stalk has an unpleasant smell and bitter taste. Native to North America, stillingia has been used extensively to treat syphilis. Herbalists also use this herb as a blood purifier, digestive aid and immune enhancer. Edgar Cayce recommended Stillingia as a blood purifier and digestive aid, especially with reference to stimulating the liver, kidneys and spleen. Stillingia was mentioned in 201 readings between 1924-1941. Stillingia utilization peaked in 1928 with another notable increase in 1935.
thus building or purifying the blood supply and adding to the gastric flow. in such a manner as to STILL the circulatory forces there. 5559-1 . . . the stimuli - both in the Stillingia and in the alcohol content, WITH the Ambergris - for the gastric forces of the intestines and stomach. 4721-2 . . . (Question) What is the condition of the spleen? (Answer) Taxed through the strain mentally and through the nerve system general. Stillingia and Calisaya, especially, for the liver and spleen. Background: Native to Europe and now widely distributed in North American, yellow dock has traditionally been used as a mild laxative and liver cleanser. It was also used externally to relieve insect stings. 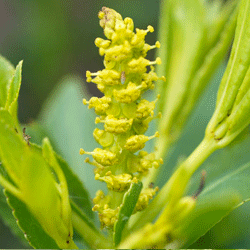 Today, herbalists use yellow dock as a blood cleanser, tonic and builder. It is also used to stimulate the liver and gallbladder and aid in digestion. The characteristic of this plant is the light green narrow leaves, curled at the long edges, a stem 2 or 3 feet high, and a deep root which is bright yellow when the outer bark is scraped away. The roots are gathered in the fall, thoroughly cleaned, split lengthwise, and dried. A tea made from yellow dock root is mildly cathartic and promotes the flow of bile. Edgar Cayce recommended yellow dock root as a digestive aid and blood purifier, working especially with the liver and pancreas. Yellow dock root was mentioned in 265 readings between 1911 and 1944. Yellow dock root utilization peaked in 1924 and decreased markedly with only a slight increase between 1932-1935. Constituents: Poke root's main constituents include triterpenoid saponins, alkaloid, resins, phytolacic acid, tannin, formic acid, fatty oil and sugar. and then stimulate all excretory system, and the nerve centers that are released, and we will bring the better conditions to the body. Taking, then, this first: Syrup Sarsaparilla, Syrup or Fluid Extract Wild Cherry Bark, Fluid Extract Stillingia, Fluid Extract Yellow Dock Root, Fluid Extract Poke Root. Add to this sufficient simple syrup to make 12 ounces. The dose would be teaspoonful three times each day, until the greater, or until three-fourths of this has been taken. Then, through deep manipulations, osteopathically, reduce the condition in the dorsal region, 6th and 7th, 8th and 9th, reflexly. This will stimulate also the whole excretory system. At the same time taking those vibrations of the violet ray, using the heavier applicator, for three minutes each evening. Do not take this while medicinal properties are being taken, but after all of this has been taken. Begin with osteopathic treatments before the whole quantity is taken. Background: Burdock grows wild throughout much Europe and the northern United States. 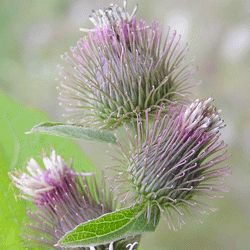 Traditionally, burdock was used as a blood purifier and to treat skin sores. as a liver purifier and hormone balancer, especially in cases of skin, arthritic and glandular problems. The large-leafed plant bears thistle-like red or purple flowers set in a round, fruiting head, covered with burrs. Burdock grows wild along field borders from July to September and the burrs cling to the fur of any passing animal or to a person's clothing. The idea for the product known as Velcro came from the sticking quality of the burrs. Burdock root contains: Approximately 27-45% inulin, mucilage (up to 75% of the root is carbohydrate in the form of fructo-oligo-saccharides (FOS) including inulin); 0.06-0.18% essential oil with so far 66 identified components; antibacterial polyacetylenes; bitter substances (i.e. lactones); 1.9-3.65% polyphenols including caffeic acid, chlorogenic acid and other powerful flavonoid-type antioxidants; sitosterol and stigmasterol. According to the Cayce readings, the intended action of burdock was as a digestive stimulant to the stomach, intestines, pancreas and liver. Burdock was mentioned in 160 readings between 1911 and 1944. Beta vulgaris (Linn.) is a native of South Europe, extensively cultivated as an article of food and especially for the production of sugar, and presents many varieties. It is derived from the Sea Beet (B. maritima, Linn. 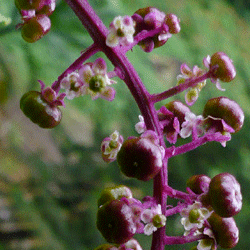 ), which grows wild on the coasts of Europe, North Africa and Asia, as far as India, and is found in muddy maritime marshes in many parts of England, a tall, succulent plant, about 2 feet high, with large, fleshy, glossy leaves, angular stems and numerous leafy spikes of green flowers, much like those of the Stinking Goosefoot. The lower leaves, when boiled, are quite equal in taste to Spinach, and the leaf-stalks and midrib of a cultivated form, the Spinach Beet (B. vulgaris, var. cicla), are sometimes stewed, under the name of Swiss Chard (being the Poirée à Carde of the French, with whom it is served as Sea Kale or Asparagus). This white-rooted Beet is also cultivated for its leaves, which are put into soups, or used as spinach, and in France are often mixed with sorrel, to lessen its acidity. 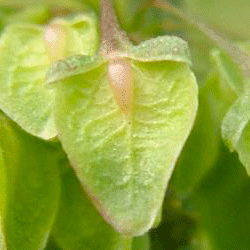 It is also largely used as a decorative plant for its large handsome leaves, blood red or variegated in colour. 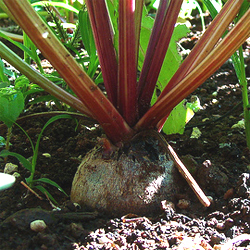 Its root, thoughcontaining almost as much sugar as the red Garden Beet, neither looks so appetizing nor tastes so well. Edgar Cayce readings have over 113 references to beet sugar or beet juice, where the pancreas, kidneys and digestive organs were uncoordinated or out of balance. Now, we find, we have given very specifically as to how these medicinal properties should be prepared. We would prepare the sage tea first, while warm, sufficient to easily dissolve the beet sugar, and only use beet sugar. This should be prepared in the medicinal properties, then adding Ambergris dissolved in the alcohol, then adding the Gin (Gordon's dry), then adding the Cinnamon. These properties taken in this manner with the system, the sage becomes the sedative, and an active principle with the gastric juices and an incentive to the emunctories in liver, and with the sediments from the Ambergris as stimulated by the alcohol, and beet sugar, will give the action necessary to the pancreas and duodenum to receive the incentive for their functioning. This we find in the sugar properties, with the mixture in the system, does not become the active principle as that in cane sugar. Hence the beet or vegetable. The dose would be two (2) teaspoonfuls half an hour before each meal. Do that, and we will find this: The sage as a sedative to the intestinal tract, especially in the action of the pancrean and gall duct forces over the body; the gin as the stimulation to the kidneys in their action in eliminating; the sugar, Beet sugar with Ambergris as the force necessary to create that which will produce the healing forces to the intestinal lining, as it were, itself. Do that. To one (1) gallon of rain water, add eight (8) ounces garden sage. Reduce by simmering (not boiling) to one (1) quart. Strain while warm and add four (4) ounces of BEET sugar - only beet sugar - first dissolved in two (2) ounces of hot water. Fifteen (15) grains of ambergris dissolved in one (1) ounce of pure grain alcohol. Shake solution together before the dose is taken, which should be teaspoonful four (4) times each day, half an hour before meals, half and hour before retiring. .nothing that carries too much sugar - nothing that carries too much alcoholic stimulants of any nature, or that will PRODUCE alcohol from within the system, see? If coffee or tea is taken, take without sugar. If sugar is used, only use beet sugar, and in small quantities. (Q) Has the body diabetes? (A) A touch of same, yes. This was indicated by the condition in the kidneys - also the digestion - though not in a virulent form at present. The relief of the condition - as is seen through the properties as taken - will overcome these conditions.